The monsoon is a love - hate season. You may hate the wetness, the puddles, the sniffling, the darkness of the skies, the difficulty in waking up but you can't deny that it is magical time with the cooing of the cuckoo, dancing of the peacock, crispy pakodas, hot chai ... the list is endless! Let's celebrate the Magical Monsoon!! 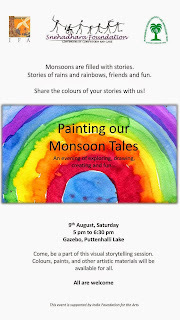 Paint your favourite monsoon scenes!! Tell your rainy day tales!! Children, parents, the young at heart - all are welcome.